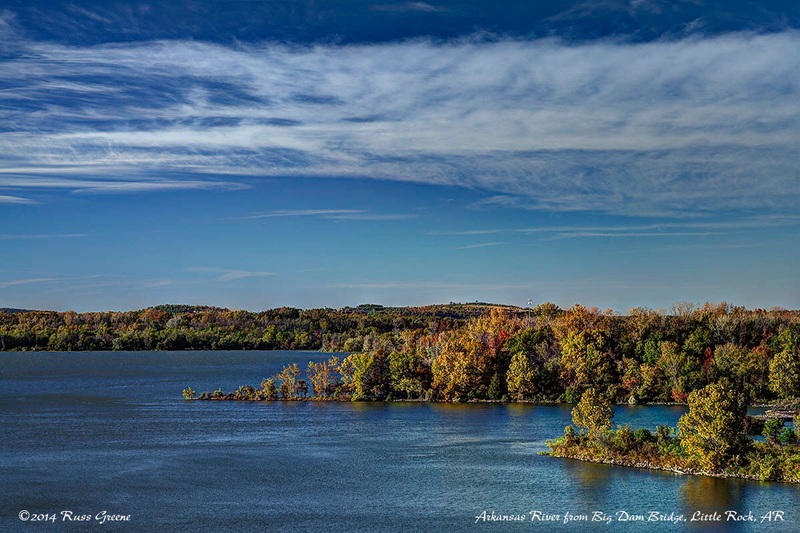 A little piece of the Arkansas River as seen from the Damn Big Bridge… no wait… It’s the Dam Big Bridge. LOL. Brrr + freezing = brreezing. Is too a word! Haha. OK, that’s my bad joke for the day. That’s probably not true. I’m bound to make others. As the comedian said “…but seriously folks…” It is friggin cold here! Where am I? That’s a game we’re playing in another post, but I’ve moved on from there. I’m currently outside of Little Rock, Arkansas. Actually, I’m closer to North Little Rock and even closer to Scott. I’m currently hole up–and you can believe that’s what I’m doing because it’s below freezing!–at Willow Beach Campground. Actually , I’m getting ready to climb on the motorcycle to run out for some groceries, a drive of some 20 minutes, one way. “It’s below freezing, Russ. Are you nuts?” you say. You meant that rhetorically, I presume. Ha! 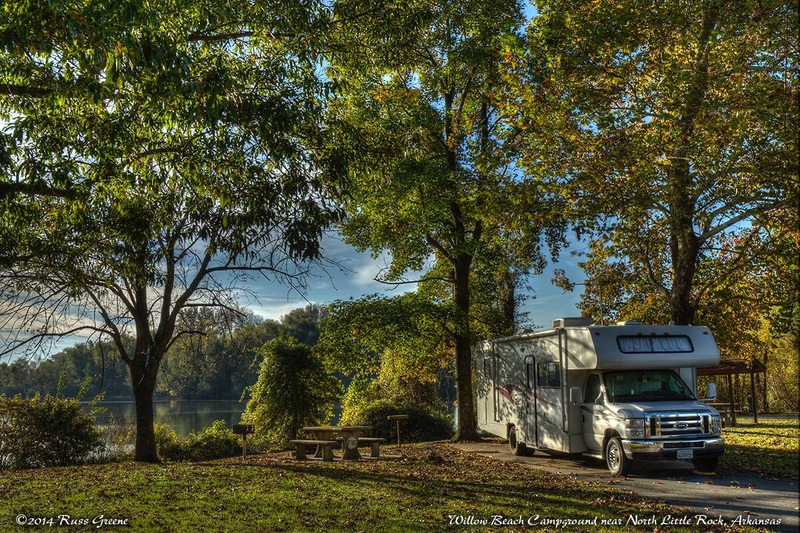 Charlene, my RV, relaxing at Willow Beach Campground. One morning I awoke to find like a gazillion birds in the lake in the background. OK, maybe I exaggerated a little. Maybe it was only a bazillion. Ha! There were blue heron’s egrets, geese and cormorants if I’m not mistaken. Willow Beach is an Army Corps of Engineers (COE) campground. I’m here because it’s not too far outside of Little Rock, the state capitol, which happened to be along my route from north to south, a route I decided to take–Minnesota, Iowa, Missouri, Louisiana–in order to stay one step ahead of winter’s chilling grasp. Oops. I blew that one. Nevertheless, I’m hanging tough for another day or two before moving on because there is more I want to see while I’m here and because there’s really nowhere I can drive in a day to escape the big chill. I also chose to stay at Willow Beach because–ya’ll know by now so let’s hear you say it together–“Russ, you’re cheap!” I prefer the term “thrifty”, but I’ll own it. It’s about $10 a night for me here with the Senior Pass, and that includes water and electricity. I’d say it includes showers, which it’s supposed to, but there is little point in trying to use the shower here. Long story… just don’t expect to find a usable shower in the men’s room should you come to this otherwise pretty nice RV park. 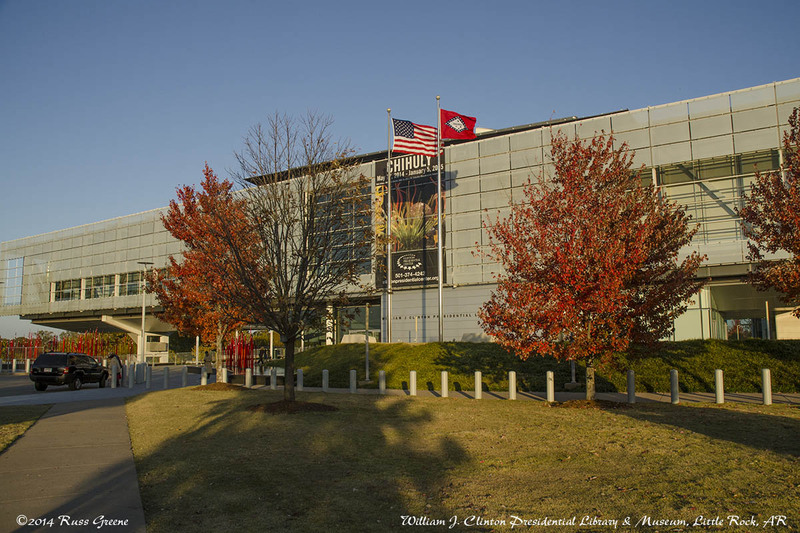 The William J. Clinton Presidential Library and Museum. This is just one of the buildings that are part of the complex. This one houses the museum. Yesterday I went over to the William J. Clinton Presidential Library and Museum in Little Rock. Like other Presidential Library/Museums, National Parks, etc. you might visit, there’s an introductory video of some 15-20 minutes. There’s also a free tour of about an hour given several times a day. Then there are the exhibits chronicling Clinton’s life and Presidency. I watched the video and took the tour. I also spent some time exploring the exhibits but I had a difficult time with those. No, not because of my political values, not because of the man himself, or his political values or career, nor because of his personal life or anything like that. It was because of the displays and the difficulties I typically have with such things. I’m a very slow reader and these sorts of things are often so packed with information that I get frustrated not being able to go through them as quickly as I’d like and this frustration is distracting making it even more difficult to go through them. Then, at the Clinton exhibits, there are more than a few videos playing around the room, all playing at the same time, and I found that I really had to work hard to concentrate on the one I was looking at, or the text I was reading, because of all the background noise. The displays also suffer from poor lighting with many of them being difficult to see and read in places because of reflections coming off of the glass. It was also a bit chilly on the second floor. All this came on top of difficulties I had locating the place and parking once there. Not because there wasn’t enough parking but because the signs pointing to it seemed to lead me in circles. Also, I’d phoned the place no fewer than three times and was never able to get a real person on the phone to ask my questions that were not addressed in the voice jail system. Plus, the one message I’d left the preceding day never received a reply. It was just like dealing with, umm, err, government. I guess I shouldn’t have been surprised. 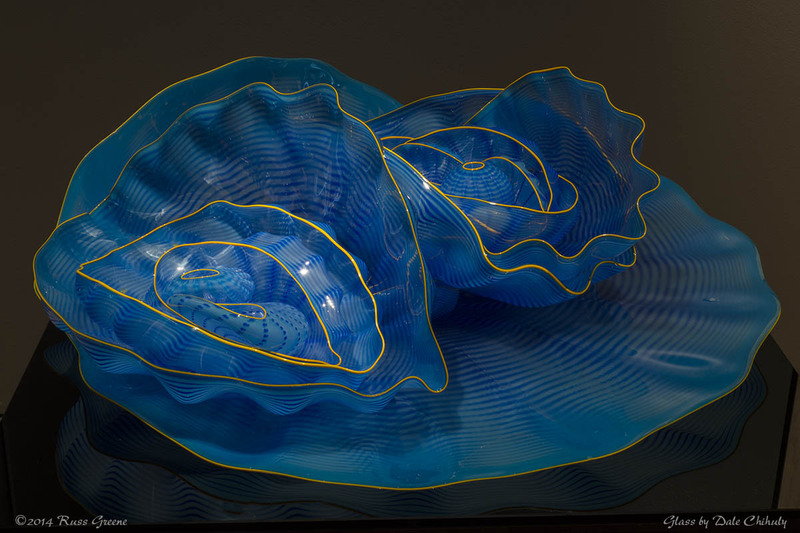 I had the good fortune of arriving at the William J. Clinton Center during the time that Dale Chihuly was exhibiting some of his amazing and incredibly beautiful glasswork. What did absolutely thrill me about the place was the Dale Chihuly glass on exhibit. Now, I don’t know what art has to do with politics but I’m really glad to have found this marvelous stuff on display. I spent most of my time at the center admiring and photographing the glass. I’m not well educated about art. It’s not surprising then, that I hadn’t heard of Chihuly, but it’s a name I shall not soon forget. Also of visual interest and appeal to me were some of the gifts of state on display. I’m not sure that’s exactly the right terminology, but any gift given to a sitting President by a foreign dignitary with a rank above mayor becomes property of the USA rather than the President. 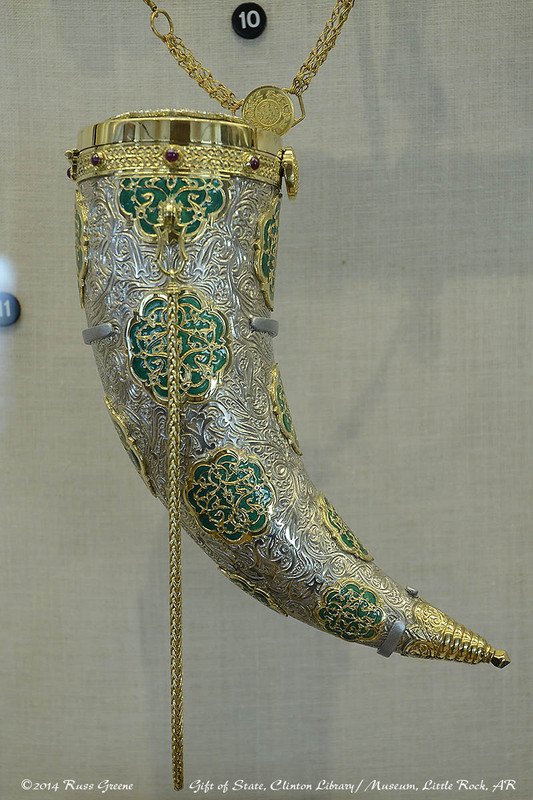 Some of these were very intricate works of at, lavishly decorated with silver and gold, some with jewels. One of the exquisite gifts received by President Clinton while he was in office. It became property of the US government, as do all gifts given to a sitting President by foreign dignitaries with ranking of that above Mayor. Maybe it’s Mayor and above. I don’t recall for certain. If you ever have a chance to see some of Chihuly’s work I’d say go for it. As for the William J. Clinton Presidential Library and Museum, yeah, I think every Presidential Library/Museum is something we should see. For me, now, it’s time to get going for those groceries. Man, it’s brreezing out there.